VueScan For Linux is a powerful, easy to use program. VueScan For Linux and SilverFast are the two leading multi-vendor scanner programs. Some differences are:VueScan For Linux supports over 1200 flatbed and film scanners and 321 digital camera raw file types, and is available for Mac OS X, Windows and Linux. VueScan For Linux automatically adjusts images to optimum color balance, which reduces the need to manually do this in Photoshop. ...... true to life. 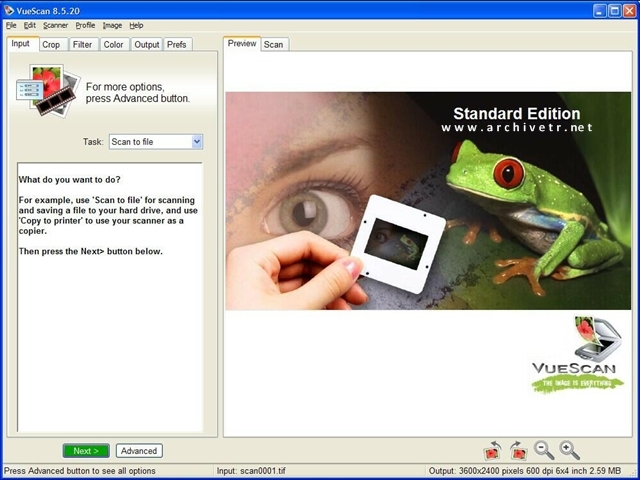 Supporting more than 100 brands of negative film, VueScan For Linux offers options for scanning faded slides and prints, batch scanning, IT8 color calibration and other advanced scanning features. Supported scanners - VueScan For Linux supports 750 scanners and SilverFast supports 289 scanners. Universal Binary - VueScan For Linux runs FASTER on Intel Macs because it is a universal binary. Silverfast is an older PowerPC program that runs slower on Intel Macs (it has a universal binary launcher, but the SilverFast plugin is PowerPC only). Multi-processor - VueScan For Linux runs faster on multi-processor systems (including multi-core systems) on Windows, Mac OS X and Linux. Silverfast doesn't have multi-processor support and is slower. Number of scanners - a single copy of VueScan For Linux can work with all supported scanners, but you need to purchase and install a separate copy of SilverFast for each scanner you use. Qweas is providing links to VueScan For Linux 9.0.81 as a courtesy, and makes no representations regarding VueScan For Linux or any other applications or any information related thereto. Any questions, complaints or claims regarding this application VueScan For Linux 9.0.81 must be directed to the appropriate software vendor. You may click the publisher link of VueScan For Linux on the top of this page to get more details about the vendor.